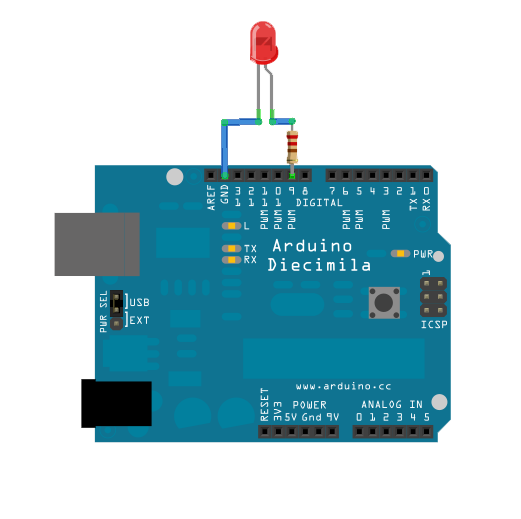 This example shows how to send data from a personal computer to an Arduino or Genuino board to control the brightness of an LED. The data is sent in individual bytes, each of which ranges in value from 0 to 255. The sketch reads these bytes and uses them to set the brightness of the LED. You can send bytes to the board from any software that can access the computer serial port. Examples for Processing and Max/MSP version 5 are shown below. Connect the 220 ohm current limiting resistor to digital pin 9, with an LED in series. The long, positive leg (the anode) of the LED should be connected to the output from the resistor, with the shorter, negative leg (the cathode) connected to ground. set the brightness of the LED. - LED attached from digital pin 9 to ground. 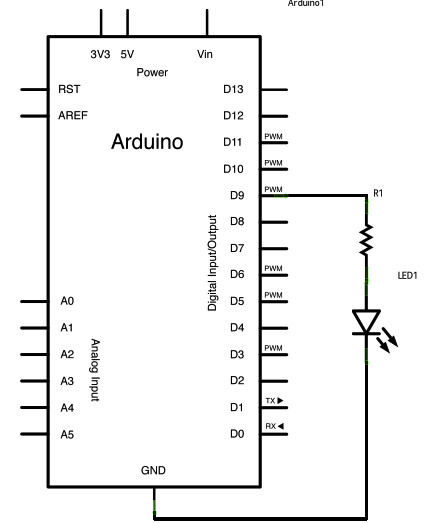 // Serial.begin() in your Arduino sketch. // it directly like this. The Processing sketch in the code sample above will send bytes out the computer serial port to the board to dim the LED. The Max/MSP patch in the code sample above looks like the image below. Copy it and paste it into a new patch window. ASCIITable - Demonstrates Arduino's advanced serial output functions. Graph - Send data to the computer and graph it in Processing. Midi - Send MIDI note messages serially. MultiSerialMega - Use two of the serial ports available on the Arduino and Genuino Mega. 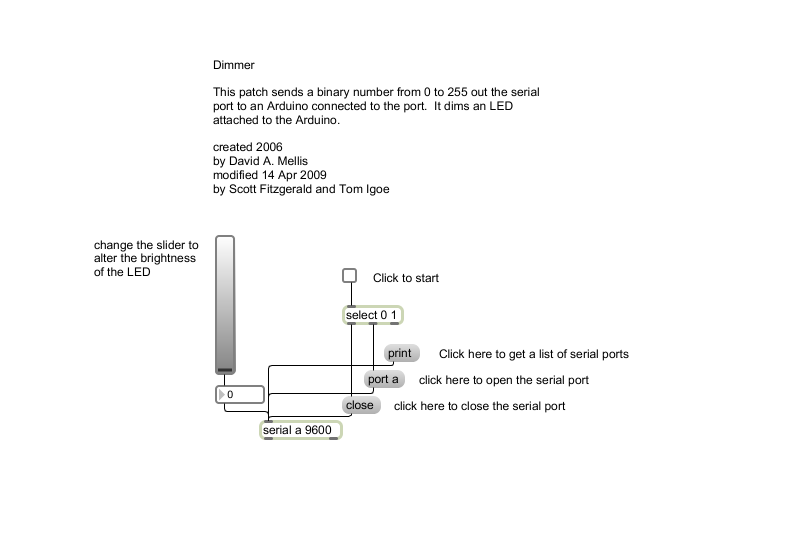 PhysicalPixel - Turn a LED on and off by sending data to your board from Processing or Max/MSP. ReadASCIIString - Parse a comma-separated string of integers to fade an LED. SerialCallResponse - Send multiple variables using a call-and-response (handshaking) method. SerialCallResponseASCII - Send multiple variables using a call-and-response (handshaking) method, and ASCII-encode the values before sending. SerialEvent - Demonstrates the use of SerialEvent(). VirtualColorMixer - Send multiple variables from Arduino to your computer and read them in Processing or Max/MSP.